Located in one of the best Mykonian spots, Agios Ioannis beach, this villa will be ideal for enjoying the beach of Agios Ioannis without having to planify it or go to "Hippie Fish restaurant" for a drink or nice Mediterranean food. The region is residential, very calm with a nice view to the Aegean sea, which you will enjoy form your pool area or bedroom balcony. From Agios Ioannis you are very close to Ornos village and its beaches (organized beach with many restaurants and kite surf beach), Ornos is a second "center" you can find many services and shops. 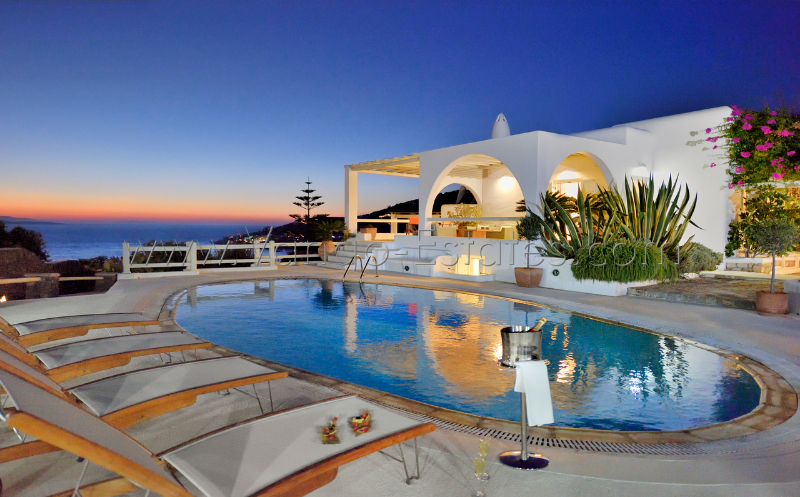 Mykonos town is a little further away (3km), you won't feel the traffic as the distance is short. Ag. Ioannis beach is a couple of minutes from your villa (by feet). As for the villa itself, it has a perfect orientation allowing you to enjoy the sea view and the Mykonian sun from your favorite area of the villa, such as the pool, pool area or one of the terraces. The villa is on 2 floors and also provides you with a guest studio, total surface is 220 sqm. Main villa has an equipped kitchen, living area, the pool, pool area and BBQ. 3 bedrooms, two with double size beds and one with twin beds plus 3 bathrooms. Guest independent studio has twin beds, a kitchen and living area. Services included are cleaning team, linen & shower towels, pool management, wifi, parking and your local manager joignable 24/7. This villa is for any type of group composition, families, friends, couples as it is close to major strategic Mykonian areas, it is in a calm and residential neighborhood, the view is fantastic, the beach is next to you. If you are a bigger group advise us as we manage other adjacent villas.